I saw this gem when I picked up Trader Joe’s Mint Flavored Fudge Brownies. Both of these items are seasonal. However, this is the pricier of the two items at $6.49. 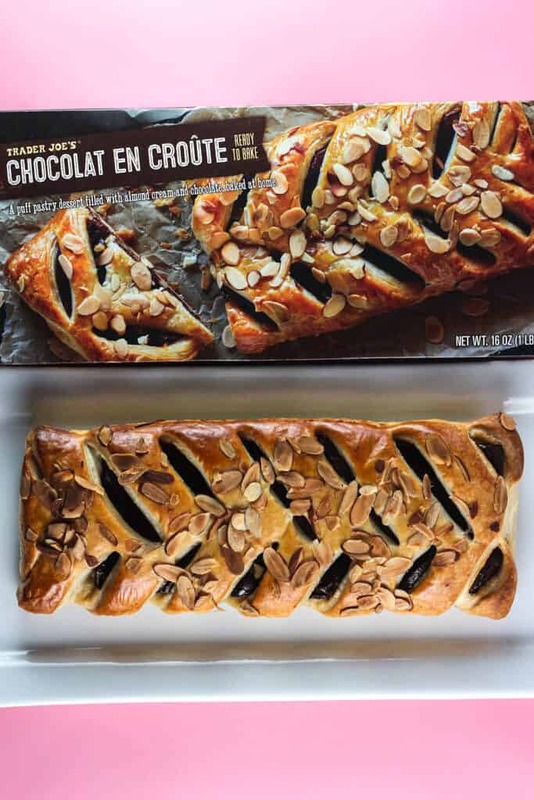 Not cheap, but a quality item that will end up looking like the picture on the box. Now, this isn’t my first en croute item I’ve tried. But all of the previous items have been more on the savory side like the Brie En Croute or the Turkey and Stuffing En Croute. While this item looks as lovely as the box, it is the taste at the end of the day that matters. And yes, the taste matches up to this products good looks. Now, to be fair, the end inch of both sides is mostly pastry. Not a ratio I loved but not a huge deal breaker either. But I did end up cutting mine into about 6 slices. It was probably a futile effort to cut the calorie count on this down. And yes, if you are trying to diet this time of year, don’t buy this. This is over 400 calories per serving. This dessert is supposed to be 4 servings. Now, I know its dessert, but there is nothing stopping you from having this as a breakfast treat either. It seemed to pair well with coffee or tea too. 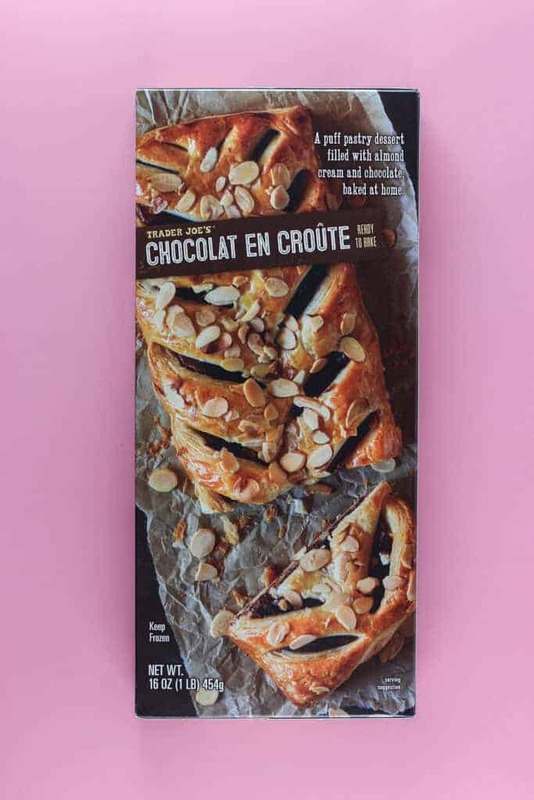 Here you have a puff pastry wrapped chocolate bar with almond cream. That was then sprinkled with slivered almonds. 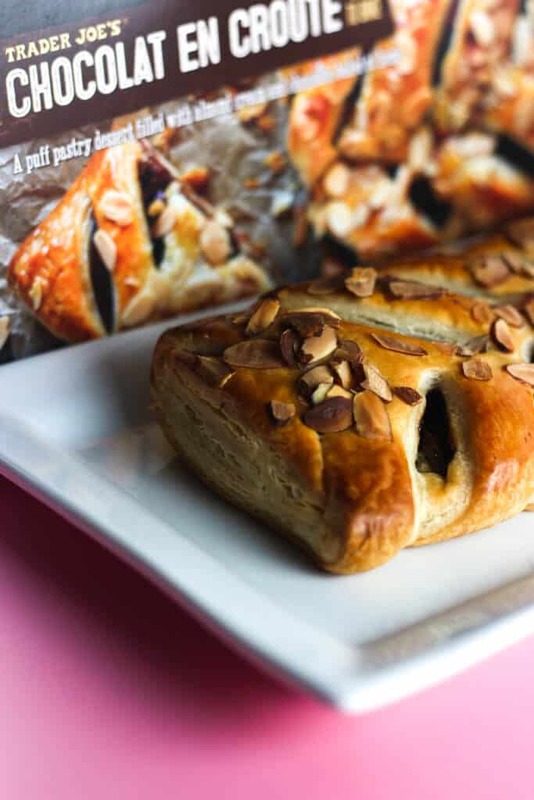 While the ratio of puff pastry is several times the amount of filling, you still have a delicious bite. The puff pastry is light and flaky on top, but seems more dense at the bottom. I enjoyed mine warmed. That way the chocolate was ooey and gooey. Now, there is nothing stopping you from enjoying this at room temperature either. Even though the top of this has almonds, this does have a distinct almond flavor in the chocolate layer as well. Product Description: Puff pastry with chocolate and almond cream and topped with slivered almonds. 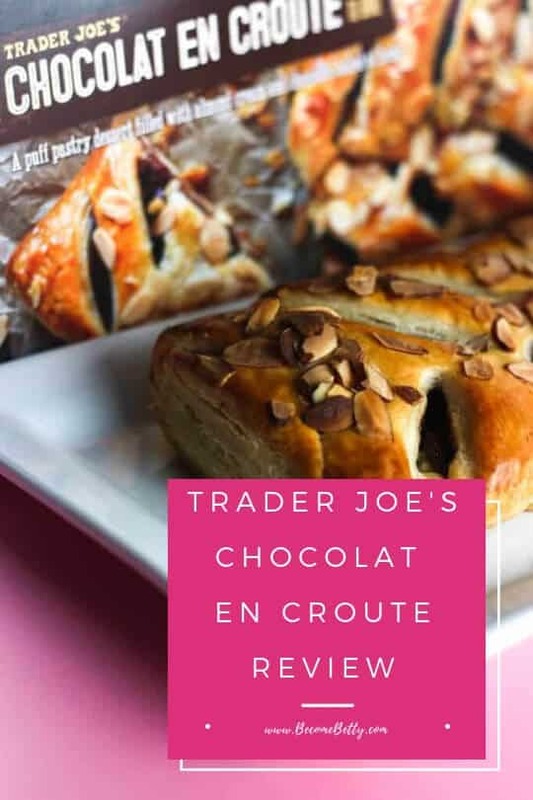 Trader Joe’s Chocolat En Croute is a seasonal frozen dessert that can be on the table in under an hour and will look fancy as anything. Don’t look at the calorie count. Just don’t. Does contain nuts, so if you are allergic, please stay away from this. I give this three YUMS!!! Oh my gosh I never have seen these or the mint chocolate brownie squares on my recent trips. I did however get the ginger granola, the four cheese balls appetizers and the french onion soup appetizers (those two in the frozen section). I hope you have a chance to purchase those and review them. I have tried all three of them now. That looks divine! Would make a great dessert offering for the holidays. Hey Ttrockwood! Thanks so much for passing along the review. BTW- since you are non dairy Vegan Jackfruit Cakes should be hitting shelves. I haven’t tried them yet, but figured I’d pass the word along. Thanks so much for stopping by!